October 13, 2017 by Ecommerce News. About Statistics with tags Spain. 8314 views. 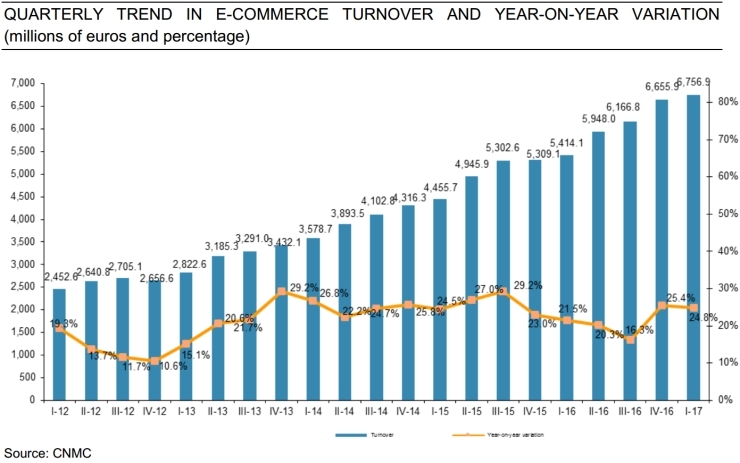 Ecommerce in Spain increased by 24.8 percent year-on-year during the first quarter of 2017. During these three months, 6.8 billion euros was spent online, while the number of transactions increased by 31 percent to 115 million. This is according to the latest data released by communications regulator CNMC. The highest revenue can be found in the travel category, which accounts for over 13 percent of the total turnover of ecommerce in Spain. It’s followed by air transport (11.2 percent) and clothing (6.2 percent). During the first three months of this year, over 115 million transactions took place in the Spanish ecommerce industry. This is an increase of 31 percent compared to the same period last year. Direct marketing (6.7 percent) and CDs, books, newspapers and stationery (6.5 percent) are the areas of activity with the highest percentage of ecommerce transactions. Of the 6.8 billion euros that was spent online by consumers in the first quarter, 55.4 percent was earned by Spanish online stores, while the remaining 44.6 percent went to ecommerce websites in foreign locations. And 93 percent of these purchases was sent to countries within the European Union, while 3 percent went to the United States.